7-Zip is a free Windows 8 file compression tool that has a high-compression ratio with LZMA and LZMA2 compression. It’s an open source software that you can use on any PC including the very new Windows 8 OS. The developers of this file compression Windows 8 software have claimed that the ratio provided by this Windows 8 file compression software is 2-10 % better than the ratio provided by WinZip and PKZip. 7-Zip facilitates you with features such as AES-256 encryption, managing files, protecting passwords, changing compression ratio, generating self extracting archives, and more. Let me quickly point down the main features of 7-Zip Windows 8 file compression software below. Comes up with high-compression ratio with LZMA and LZMA2 compression. Brings you a strong file manager. Packing / Unpacking: 7z, GZIP, ZIP, TAR and BZIP2.Unpacking only: CAB, ARJ, CHM, CramFS, CPIO, DEB, FAT, DMG, HFS, LZH, ISO, LZMA, MSI, MBR, NSIS, RAR, NTFS, RPM, UDF, SquashFS, VHD, XAR, WIM, and Z. Brings you a plugin for FAR manager. AES-256 encryption in ZIP and 7z formats. Ratio provided by this Windows 8 file compression software is 2-10 % better than the ratio provided by WinZip and PKZip. Similar software: WinRAR, System Utilities Software, Mozilla Thunderbird. Click on ‘Download’ link given in .exe file type if you have 32-bit OS or on the other ‘Download’ link if you have 64-bit OS. Click on the downloaded file to run. Proceed further with the installation steps. In short, 7-Zip is good utility file compression software for Windows 8 I found better that WinZip. 7-Zip Windows 8 file compression software does hell of an excellent job despite of being totally free. 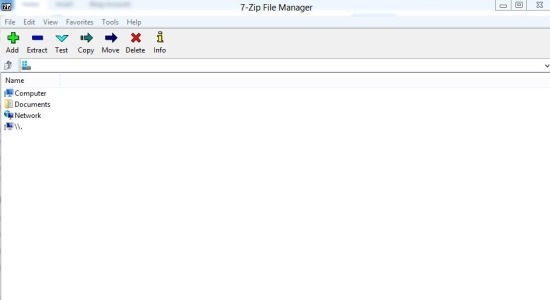 Go ahead and download 7-Zip in Windows 8 now..